A dose of reality I was thrilled to hear on my local NPR station the other day. If you haven't read Dirty Wars by Jeremy Scahill or seen the move, take the time to listen to this. Unlike the sickening lies and hollow feel-good rhetoric spilling from President Obama, you will learn something form this. A sad day and a loss for us all but Pete Seeger will be with us always. His influence and the indelible imprint of his great soul remains. Remembering the Real Martin Luther King Jr.
continue to destroy lives for the benefit of a few. We have a long way to go on that Jericho Road so get your boots on. The new year is always a good moment to look back and the most significant events of the previous twelve months. In my opinion, what stands out were the revelations made by Edward Snowden at great personal cost. Aside from the fact that every phone call you personally made over the last 20 years is recorded for posterity along with every internet purchase and interaction, it has been revealed that our government has tapped the phone of nearly every leader around the world including our closest allies. It is useful to see how we got here in order to find a way out and to prevent further abuse. Given the space limitations, this is but a cursory review of the evolution of our National Security State. Anyone who went to school when they were still teaching civics knows that the Constitution defines three branches of our government: the Executive, the Legislative (Congress), and the Judiciary. This changed inadvertently under President Truman who separated the section of the army responsible for collecting information on our foreign enemies and created the NSA. The CIA had already been converted from the OSS. In 1948, The National Security Council Directive on Office of Special Projects gave the CIA the authority to carry out covert operations "against hostile foreign states or groups or in support of friendly foreign states, or groups but, which are so planned and conducted that any U.S. government responsibility for them is not evident to unauthorized persons and that if uncovered the US Government can plausibly disclaim any responsibility for them." By the early 1950's the CIA was orchestrating coups and involving itself in the internal affairs of other governments, supporting repression and worse in Italy, Iran, Guatemala, and Vietnam. The cold war had been declared. Progressives, leftists, and labor unions in our own country became targets of monitoring and intimidation. Though the agency had no official domestic law enforcement mission, the Central Intelligence Agency Act of 1949 exempted it from having to disclose its "organization, functions, officials, titles, salaries, or numbers of personnel employed." To truly understand the problem at the root of the CIA, one would have to go back to Allen Dulles who brought members of the brutal Nazi Wansee SS over to work for the OSS as anti-communists before the end of WWII, and his brother John Foster Dulles who amped up the “Red Scare” repressions and cold war interventions of the 1950s. Unlike the CIA, the NSA's original mission grew out of the code cracking of WWII and was limited to wiretapping and cryptology directed at foreign governments that were seen as hostile and a threat to our security. This agency was kept secret for years. Though the NSA had no authority to spy on US citizens, it regularly did so, as did the FBI and CIA, spying on labor leaders, anti-war activists, and prominent civil rights activists like Dr. Martin Luther King. Given the overlap of these secretive agencies and the difficulty of separating them, I will refer to them all as the National Security State. They are, after all, different arms of the same beast serving the same corporate oligarchy. In the 1970's post Watergate period there were attempts by Congress to reel in the abuses of an out of control National Security State. The Church Committee headed by Senator Frank Church examined the role of the CIA in the orchestration of the coup in Chile that overthrew the elected government of Salvador Allende, installing the brutal military dictatorship of Augusto Pinochet. They also examined its involvement in other coups and assassination attempts as well as its domestic spying and strike breaking. In August of 1975, Senator Church stated publicly on “Meet the Press” that “In the need to develop a capacity to know what potential enemies are doing, the United States government has perfected a technological capability that enables us to monitor the messages that go through the air. Now, that is necessary and important to the United States as we look abroad at enemies or potential enemies. We must know, at the same time, that capability at any time could be turned around on the American people, and no American would have any privacy left such is the capability to monitor everything—telephone conversations, telegrams, it doesn’t matter. There would be no place to hide. If this government ever became a tyrant, if a dictator ever took charge in this country, the technological capacity that the intelligence community has given the government could enable it to impose total tyranny, and there would be no way to fight back because the most careful effort to combine together in resistance to the government, no matter how privately it was done, is within the reach of the government to know. Such is the capability of this technology. I know the capacity that is there to make tyranny total in America, and we must see to it that this agency and all agencies that possess this technology operate within the law and under proper supervision so that we never cross over that abyss. That is the abyss from which there is no return.” Remember, this was in 1975! Though the CIA seemed temporarily more limited, its secretive nature made this impossible to know. The Nixon administration led it to greater abuses with programs like the FBI's domestic counterintelligence Program, COINTELPRO, a program run by the FBI to monitor and “neutralize” citizen activism, particularly the anti-war and civil rights movements. Eric Snowden is not the first to expose government intrusion. In 1971 COINTELPRO was exposed by the Citizens Committee to Investigate the FBI, which removed secret files from an FBI office in Media, PA and released them to the press. These Activists have recently decided to reveal themselves and speak out. That same year, publication of the Pentagon Papers, the Pentagon's top-secret history of the Vietnam War, exposed years of systematic official lies about the war. Abuses continued under the Reagan administration with ex-CIA head George H.W. Bush as Vice President. The terror unleashed in Central America by Reagan and the CIA led to waves of refugees which our government refused asylum, instead flying them back to certain death at the hands of the dictators we were supporting. This gave birth to the Sanctuary Movement as American churches protected these refugees and worked with other citizen groups against our involvement and support of brutal death squads in El Salvador, Nicaragua and Guatemala. In response, the Reagan Administration unleashed the national security state with spies infiltrating citizen activist and church organizations. What was revealed under Reagan, culminating in the Iran Contra Hearings, was the inseparability of the CIA from international terrorist groups and from organized crime. Leslie Cockburn, in her book “Out of Control,” documents CIA gun and drug running via front businesses run by CIA associated Cubans in Miami tied to Colombian cartels. She names retired American John Hull and others with ranches in Honduras where Colombian cocaine was loaded onto US Army planes and flown into the US through military bases. It connects them to the White House via Oliver North and others. This was also documented by journalist Gary Web in his famous San Jose Mercury News article entitled “Dark Alliance” for which he was hounded out of journalism and later died under mysterious circumstances. Aside from support for terrorists like Jonas Savimbi, the Contras, and brutal repressions in East Timor, and Guatemala, the CIA's involvement in the training, organization, and arming of radicalized fighters in Afghanistan to overthrow the government of Mohammed Najibullah paved the way for Reagan and the CIA's greatest legacy: the attacks of September 11th. The bombing of the Word Trade Center in September of 2001 did more to escalate the power of the National Security State than anything else could have. Though conspiracy theories around this event have flourished, what is known is that the perpetrators of this horrific event had been carefully followed prior to the attack. Author James Bamford, in his book, “The Shadow Factory” published in 2008, found that the NSA had been closely monitoring these hijackers as they moved freely around the U.S. communicating with Osama bin Laden's operations center in Yemen. The NSA had even tapped bin Laden's satellite phone, starting in 1996. "The NSA never alerted any other agency that the terrorists were in the United States and moving across the country towards Washington." Bamford stated in a PBS interview. There had been warnings which are well documented of this attack but apparently the National Security State, which has included the Presidency since Reagan and was then headed by Bush had more to gain by letting it proceed. Edward Snowden is far from the first to see the overreach of the National Security State and make it public, though hopefully he is the most effective. Thanks to Mr. Snowden, we have become increasingly aware that the National Security State has become, in effect, a fourth branch of government with more power than the rest combined. It runs our drone wars and “black ops,” dictates our foreign policy, and exerts a heavy influence on our embedded press. Its legacy includes the needless death of millions around the world, the plague of crack cocaine, the filling of our prisons and now the loss of our personal privacy. It is true that we have enemies, largely of our own creation, but a few rag-tag third world radicals with bronze age ideas are not an adequate justification for the most intrusive police state imaginable. The confluence of secretive power, paranoia and the rapid advances in technology have created a situation akin to the Sorcerer's Apprentice. Power feeds on itself and naturally grows if unchecked and the technology is hard to stay ahead of taking on a life of it's own. It is time to reconsider Truman's misgivings and Kennedy's thoughts on breaking up the CIA. We know from the past that one cannot control this secretive, above the law wing of government by simply writing new laws. President Obama's meager efforts via a panel of insiders is a cynical photo-op solution. He has continued to deny and defend the worst abuses of the NSA and just recently signed into law the newest National Defense Authorization Act which authorizes the military to be able to arrest you without charges and hold you indefinitely. The court has also found massive indiscriminate domestic surveillance to be legally acceptable. Given the National Security connections to the White House, one cannot expect more without massive public outrage. It is time for us to abolish the CIA and NSA and hand the authority to monitor known enemies back to the Army with heavy independent oversight. It is time to reassert our 4th Amendment rights to privacy. 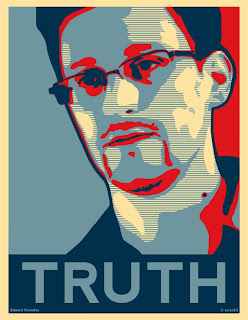 Edward Snowden did his job as a citizen, the rest is up to us.